Is it possible to arrive at the idea of the Trinity apart from divine revelation? A few philosophical theologians have thought so, including Richard of St. Victor, G. W. F. Hegel, and Richard Swinburne. Richard of St. Victor, followed by Richard Swinburne, argues that “if God is loving, then he must share (hence the Son); and cooperate in sharing (hence the Holy Spirit)” (527). 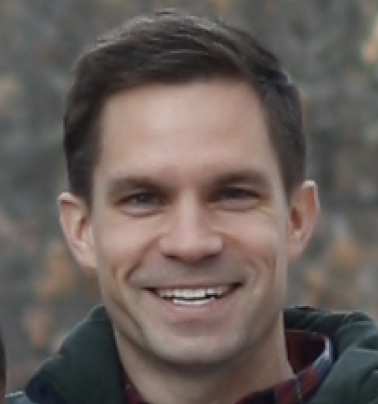 * David Brown casts doubt on this theory by asking whether it is necessary for another to exist in order for one to love, and whether “cooperation in love must generate a third person” (527). Hegel attempts to arrive at the Trinity by a different route. He sees self-consciousness as depending on the existence of other beings. Accordingly, “it was necessary for the Father to have the Son as other than himself before a coming to full self-consciousness could occur in the life of the Holy Spirit” (526). The reason for differentiating members of the Trinity comes from the data of the New Testament itself, but even the New Testament does not always clarify which member of the Trinity is the subject. Additionally, it is not clear how metaphorical and how literal are the statement of the relationships among the members of the Trinity. In what sense is the Son a son of the Father? And in what sense does the Father and Son “send” the Holy Spirit. As David Brown says, “Sonship and procession are both metaphors. But if the persons do not literally ‘generate’ or ‘send,’ what have we left as the distinction between them?” (528). The cumulative effect of these models—whether Richard Swinburne’s philosophical social theory or Augustine’s psychological theories—magnifies rather than diminishes the philosophical problem of the Trinity. Not only are they insufficient within themselves, but they contradict other models in important ways. Perhaps it would be more profitable for philosophical theology to provide a critique of our cognitive scope—a scope that is so narrow that it will not allow us to conceive of God’s unity and diversity at the same time without distorting either. Such a critique might proceed thus: if God exists, then we would expect him to be of such a nature that would be so clearly and utterly beyond the range of our intellectual grasp, and to exist beyond this range in those areas that are basic to our cognitive processes: identity, singularity and multiplicity. The doctrine of the Trinity confounds our thinking, but this should serve to confirm, rather than disconfirm, our belief in it. What else would we expect about the nature of a God who is independent of our own categories of thought? In fact, if the doctrine of the Trinity could have been conceived of on purely logical grounds, as Hegel and Swinburne seem to affirm, then it should seem intuitive to the logically-inclined person. But as soon as the doctrine is explained in such a way so as to seem intuitive, it slides inevitably either toward overemphasizing God’s singularity (to the diminishing of his multiplicity) or toward overemphasizing God’s multiplicity (to the diminishing of his singularity). Swinburne’s social model well accounts for God’s threeness, but not his oneness. Augustine’s psychological models well accounts for God’s oneness, but not his threeness. Such a critique should also suggest a model or illustration of our limited cognitive scope, as it stands confounded by the doctrine of the Trinity. One such illustration might proceed thus: An observer stands several yards in front of a colossal wall, on either end of which is a tall tower (God’s threeness and God’s oneness, Figure A). The observer, due to his scope of vision, can see only one tower at a time. When he moves his head to see the other tower, the other disappears from his vision (Figures B and C). Wanting to see both towers at the same time, the observer looks through a convex lens (a model or theory of the Trinity). He can see both towers at the same time, but the towers are no longer straight up and down, and the wall appears to be curved (Figure D). Thus, the observer’s perception of the wall and tower is constrained by his scope of vision: he can (1) observe one tower straight up and down (God’s oneness), (2) the other tower straight up and down (God’s threeness), or both towers appearing to lean toward the center (God’s oneness and threeness as explained in a model or theory of the Trinity). But he cannot both observe towers at the same time and perceive them as straight as they truly are. 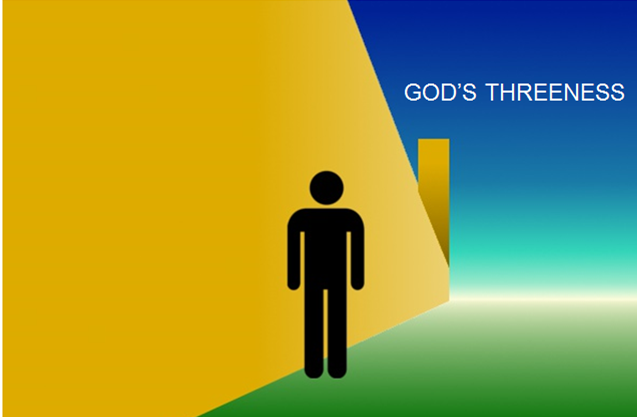 Figure A – An observer stands several yards in front of a colossal wall (God’s nature), on either end of which is a tall tower (God’s oneness and God’s threeness). 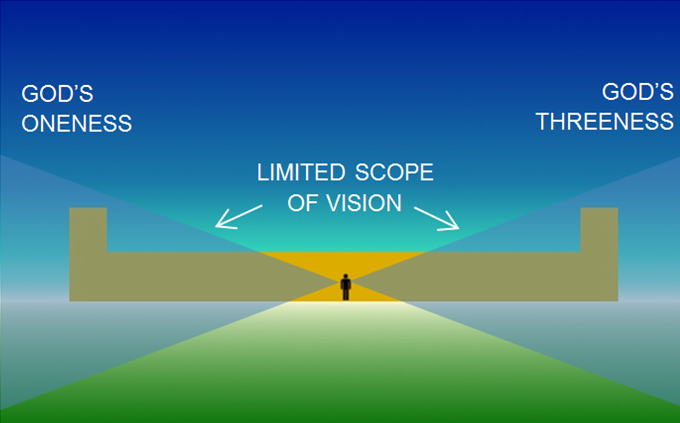 Figure B – The observer, due to his scope of vision (limited cognitive scope), can see only one tower at a time (either God’s threeness or God’s oneness). 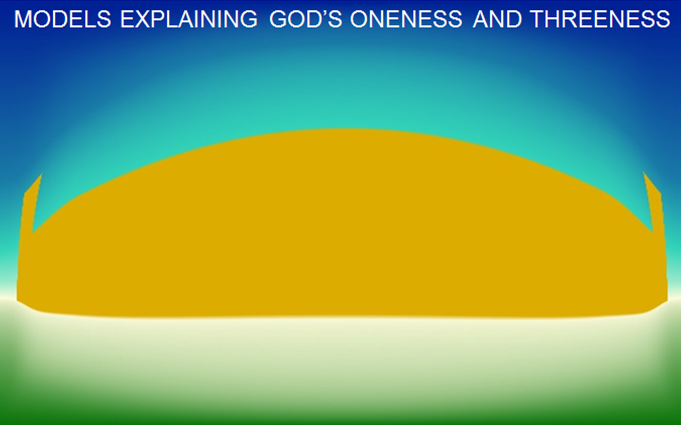 When he moves his gaze to see one tower (God’s oneness), the other disappears from his vision (God’s threeness). Figure C – The observer, due to his scope of vision (limited cognitive scope), can see only one tower at a time (either God’s threeness or God’s oneness). 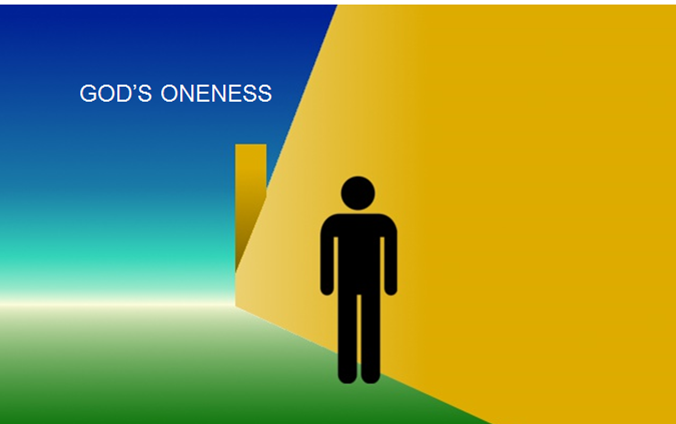 When he moves his gaze to see one tower (God’s threeness), the other disappears from his vision (God’s oneness). Figure D – When the observer looks through a convex lens (theories of the Trinity), he can see both towers (God’s threeness and God’s oneness) at the same time, but now the image is distorted: the towers are no longer straight up and down, and the wall appears to be curved (Any model of God’s Trinity inevitably inadequately portrays God’s threeness, God’s oneness, and God’s nature as a whole). We understand oneness, and so we can understand that God is one. And we understand threeness, and so we can understand that God is three. But our cognitive scope forbids us from understanding both at the same time without distorting one or the other. The reason for the limitation of our cognitive scope is that our cognitive processes are constrained by the properties of identity and non-contradiction. Yet it makes sense that the Being from whom these properties originated stands above these properties, and that his standing above these properties finds manifestation in at least one feature of his existence, namely, his Triunity. *Page numbers refer to Quinn, P. and Taliaferro, C., eds. A Companion to Philosophy of Religion. Malden, MA: Blackwell, 1997. Jonathan, I have often thought that a good deal of revelation is like this. God is condescending to our finiteness in order to communicate his truth to us. So eternal things like “chosen before the foundation of the world” is related to time from our perspective rather than God’s, and creation in “seven days” (literal days in my mind) are also more from our perspective rather than God’s. We have trouble wrapping our heads around the physics of creation because we can’t conceive of light before light sources or the vast distances that are apparently involved in the universe, etc. Anyway, good food for thought.